On a recent visit to one of my favorite local brewpubs that I’d been going to for years, I noticed a much smaller menu than before, with over half of the items eliminated. Quickly scanning for my favorites, gone was the the “Killer Bread,” a mixture of melted Parmesan cheese, garlic, and mayo smeared on top of grilled rustic bread. My other favorite menu item, “Mulligatawny Soup,” luckily still remained on the menu. I wasn’t planning on ordering it but our friend dining with us had never heard of it. When the soup arrived, I encouraged our friend to try a taste of the yummy goodness. Reluctantly, he dipped his fork into the soup and carefully touched the tip of his tongue with the fork and expressed complete disgust. His heart just wasn’t in it. The name Mulligatawny is translated from the word “pepper water” by the people of South India and Sri Lanka. It’s a wonderful blend of vegetables, chicken, apples, rice, and a little bit of curry, and it’s super easy to make at home. I imagine just the name Mulligatawny might turn some people off before they even know what kind of ingredients are used to make it. Mincemeat pie has that effect on me, and I’ve got no clue what’s inside that concoction and don’t even want to find out or taste any of it from the tip of a fork. But my tastebuds love Mulligatawny, and here’s my version of it. I recommend using a spoon to eat it! Add apple, rice, chicken, salt, pepper, and thyme. 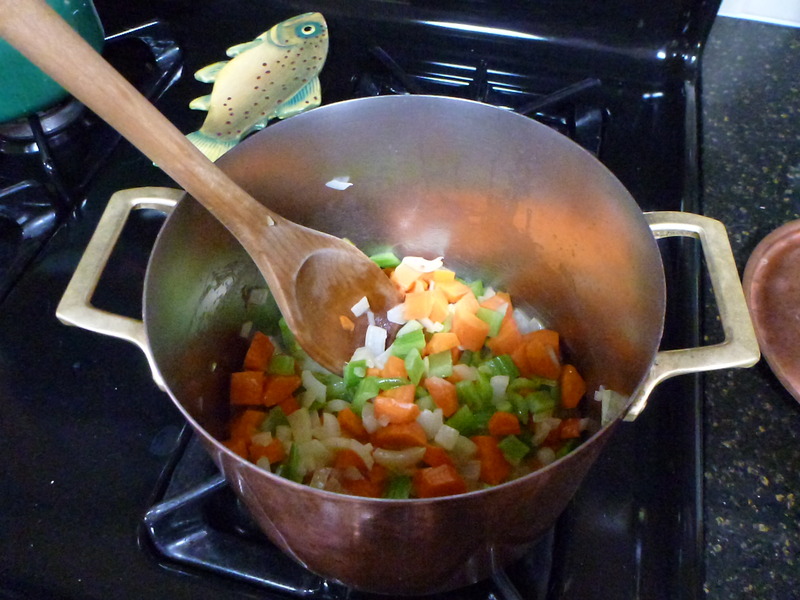 Simmer 15-20 minutes, or until rice is done. Add heavy cream, stir and enjoy. 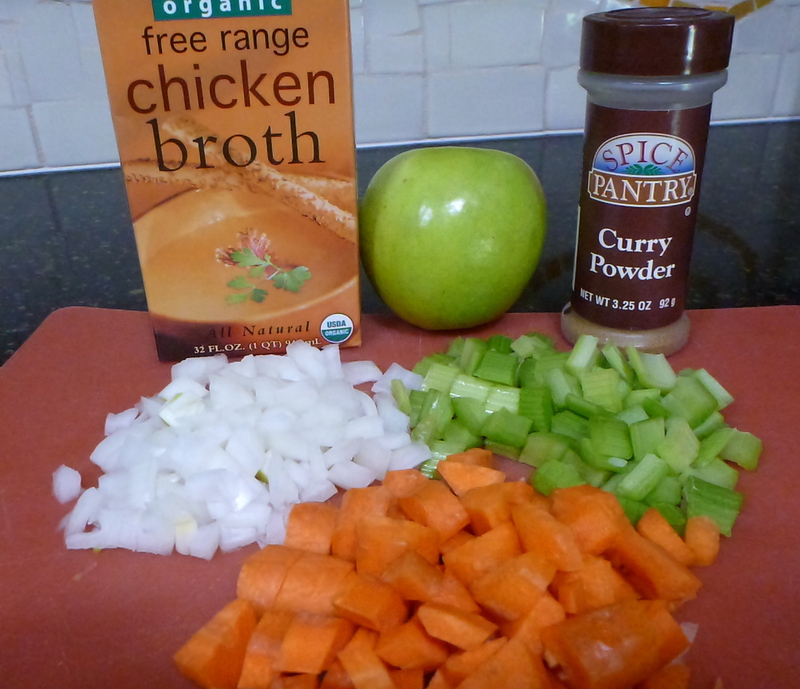 Some of the basic Mulligatawny ingredients. 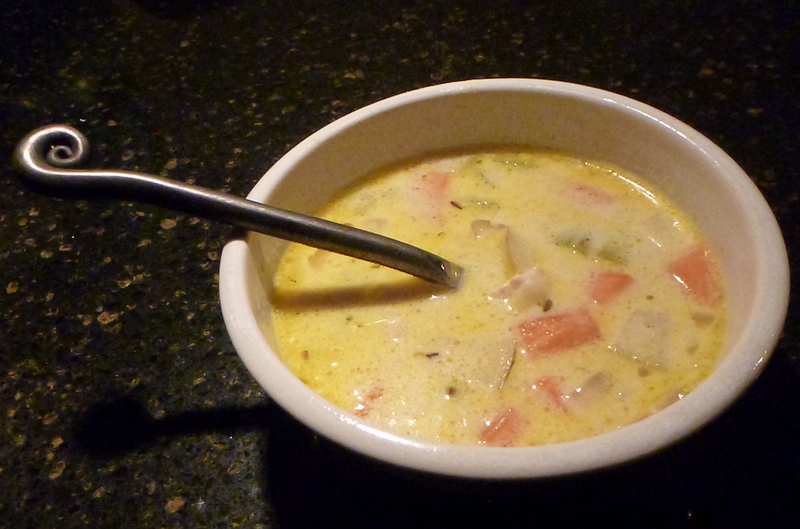 Finished Mulligatawny Soup. Like most soups, this one is better the next day.